Primarily a live performance venue, the theater does play movies. 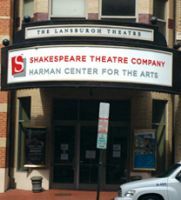 This theater is owned/operated by Shakespeare Theatre Company. This movie theater is near Washington, Pentagon, Parcel Return Service, Prs, Ft L J McNair, Fort Lesley J McNair, Fort McNair, Marine Barrks, Us Marine Corps Barracks, Navy Annex, Anacostia Anx.